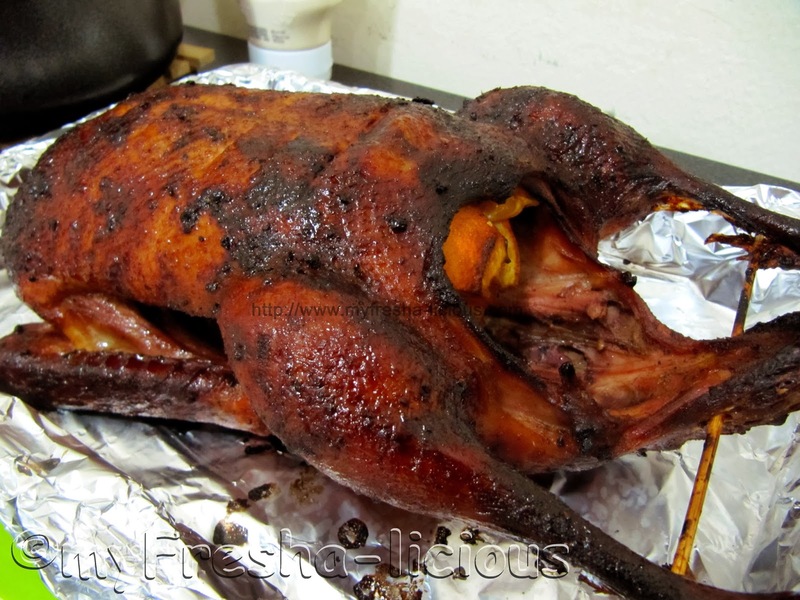 Here's another roasted bird you can serve for your Valentine's day dinner. My husband loves to roast. Roasted dishes are one of those things he would voluntarily cook. He likes to experiment on the sauces, the rub, the stuffing, and whatever processes he plans to incorporate with his roasting. In fact he had done his share of roasted dishes, mostly pork and chicken. I am not sure what came over me one day but I found myself craving for roasted duck. I was actually imagining ducks with their glossy reddish-brown skin hanging by the food counter of those food stalls in Singapore. 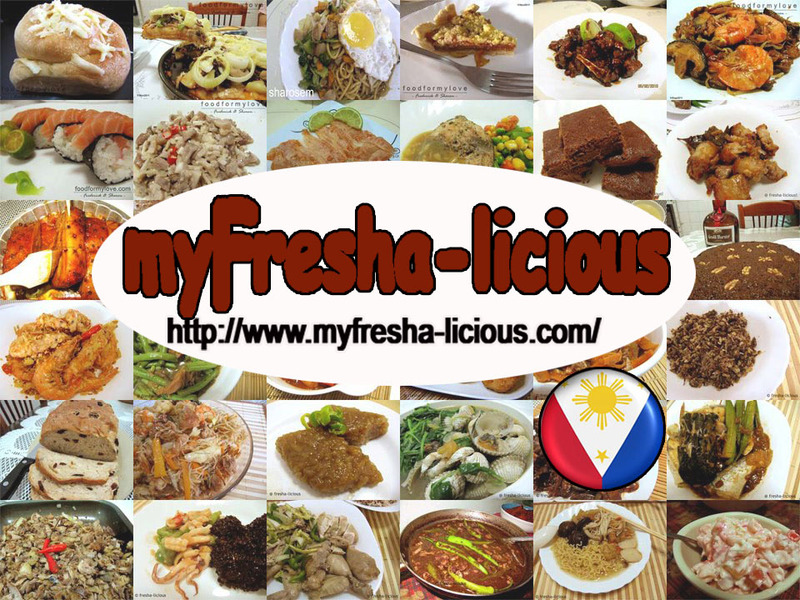 I want the thinly sliced roasted duck dip in a sweet and salty dark brown sauce that comes with yee mee noodles. So tasty and succulent. Yum-yum. My husband knowing that I've been craving for roasted duck dragged me to the supermarket one day to buy not 1 but 2 whole ducks. The ducks we bought were way expensive compared to chicken but they were large size birds. I think a whole bird can feed may be 6 to 8 people. 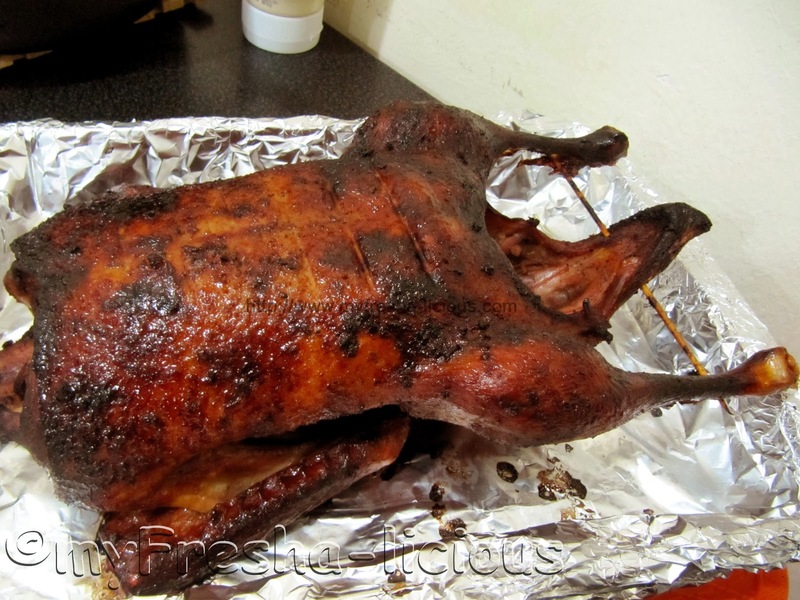 My husband initially planned to roast the duck similar to those found in Singapore or any Chinese restaurants. But he was intimidated by the somewhat complicated process. The use of a special air-blower to separate the skin from the meat, and the blanching of the chicken skin with a mixture of honey and other herbs and spices, and other things, made him backed out from roasting the bird the Chinese way. He settled with a simpler process - infusing and marinating the duck with a special sauce, rubbing the duck with some herbs and spices, and then roasting it. You just have to be careful not to over-roast the duck otherwise it will become tough and dry. 1. In a medium bowl, mix the ingredients for the marinade. Taste it to determine the amount of salt you need to add. 2. Prick the meat of the duck all over then pour the marinade on it. Rub the marinade on the surface of the duck meat including the meat under the skin, massaging each piece of the duck meat to allow the marinade to coat the meat well and penetrate deeper into the meat. Transfer the duck and marinade in a resealable plastic bag and marinate overnight in the fridge. 4. At least an hour before cooking, remove the duck from the fridge. Drain the duck and set aside the marinade sauce for basting. 5. Mix all the ingredients for the rub and massage it on the skin and internal cavities of the duck. Stuff the duck with the quartered orange with its skin on. 6. Place the duck on a rack on top of a baking dish. Baste with the marinade sauce. Cover with foil and place in the oven. Cook for about 50 minutes to 1 hour and 15 minutes depending on the size of the duck. 7. 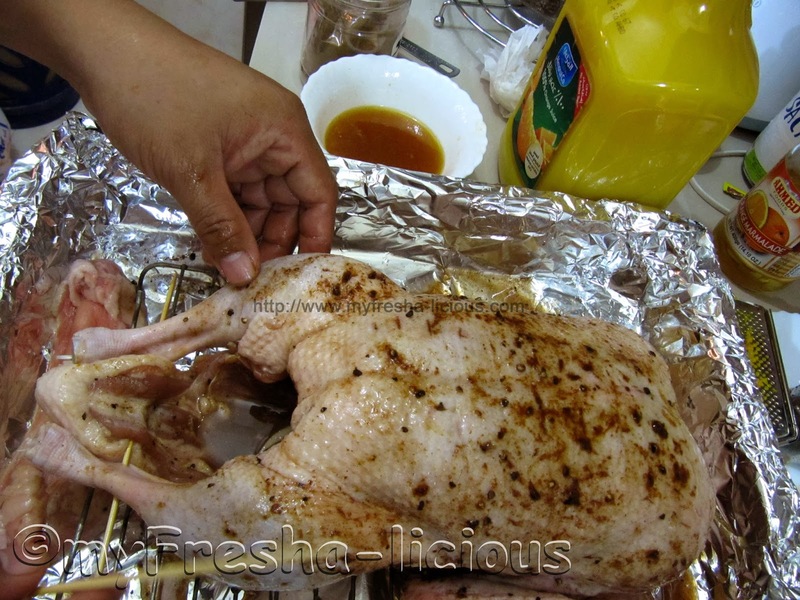 Remove the foil cover and continue roasting the duck until its skin turns brown. Flip duck and continue roasting to brown the remainder of the skin. Remove from fire. Slice the meat of the duck thinly then serve with an orange marmalade sauce.